An abusive McDonald’s customer attacked a member of staff after refusing to leave the Sussex restaurant, police have confirmed. The McDonald’s worker has spoken about the attack, saying the man swore at him before coming through the barrier and hitting him at the restaurant in Chichester on Saturday night, April 22. The male worker, who asked not to be named, said: “He seemed to have been drinking and asked for some taxi numbers, which we gave him, but when he tried to call them he couldn’t get through and started swearing and getting angry. “I asked if he was OK and he started shouting at me, at which point we gave him a refund and asked him to leave. “He threw some bits at me, nothing major, just screwed up paper and things, and started getting angry, he invited me to come over the barrier and fight him, which I refused. “I called the police and he got more angry, basically swearing at me and threatening me, then he opened the barrier, came through to the till area, and physically attacked me. “He hit me on the neck before being pushed back towards the barrier by another staff member. The worker added that security at Chichester Gate were informed and followed the man around the complex to make sure he didn’t hurt anyone else. He said he informed police that the incident had been captured on CCTV. 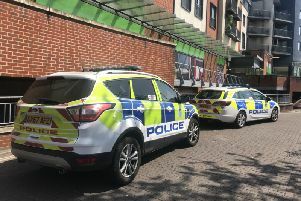 A Sussex Police spokesman said: “Police were called to McDonald’s restaurant in Chichester Gate, Terminus Road, at 9.37pm on Saturday, April 22, where a customer was reported as being abusive and refusing to leave. “He grabbed and assaulted a member of staff, who was not injured. “Officers spoke to a 35-year-old man from Chichester, who was stopped nearby a short time later.